At some point in your homeschooling journey–whether you’re just getting started or are 10 years in–you may find yourself making an out-of-state move. While homeschooling is legal in all 50 states, the laws for homeschooling vary greatly from state to state. In some states, you need to file paperwork, teach for a prescribed number of hours each day, teach specific subjects and possibly even do mandatory state testing each year. At the other end of the spectrum, you have states that only require filing the initial paperwork and then you’re good until graduation! Many homeschoolers prefer a more relaxed atmosphere not so tightly monitored by the state. 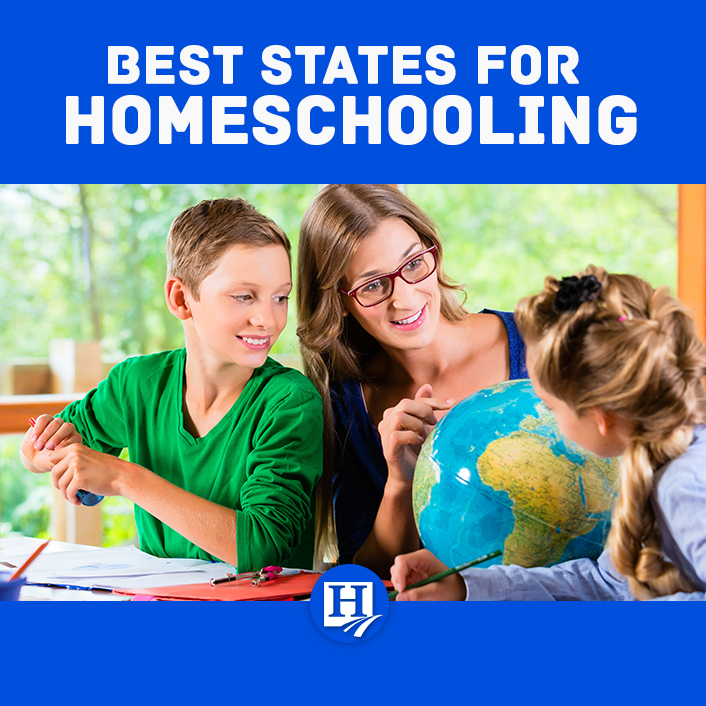 So which states are the easiest to homeschool without much state interference? Under the homeschool statute – no requirements to notify the state, get approval, take tests, or be a certified teacher. With a private tutor – the tutor must be an Alaska-certified teacher. Under school board approval – a student of compulsory school age does not have to attend school if he “is equally well-served by an educational experience approved by the school board.” A written request must be sent to the principal or school administrator asking to be excused from mandatory attendance. As a religious private school – probably the most restrictive, this method requires filing several forms upfront, keeping monthly attendance records, maintaining a permanent record, filing a corporal punishment form, and adhering to testing requirements. In addition, you may not accept state or federal funding. Select an instructor – this can either be you or it can be a family member, friend, or relative. Teach the required subjects – you need to teach subjects similar to what public school students are taught. Teach the required subjects – the state requires teaching an “adequate course of instruction,” which they define as one that includes language arts, math, biological and physical sciences, social sciences, fine arts, physical development, and health. Instruction must be in English. You need to choose a name for your homeschool. Provide “equivalent instruction” in English – presumably, this means “equivalent” to public schools. However, the State Board of Education does not define the term nor does it list required subjects. Teach the required number of days (180). Provide information to the state if required – sometimes, the state of Indiana will require online enrollment for your homeschool. Instructors must have the required qualifications – the instructor can be the parent or another person the parent chooses. That person must either be a certified teacher, have a teaching permit, or hold a Bachelor’s degree. Provide yearly notification that you’re homeschooling. Teach the required subjects – these include math, reading, English, science, social studies, physical education, and health. High school students must also be taught the U.S. Constitution, the Michigan Constitution, and the history and current form of civil government for the state of Michigan. Keep records for all students under age 16 – you don’t have to actually submit these records to anyone, but you must keep records that show the subjects taught, samples of your student’s work, and evaluations (annual test results, regular tests, etc.). You must provide your child with an education that is “equivalent” (not to be confused with “identical”) to what he or she would receive in public school. The law does not define “equivalent,” however. There are no reporting or testing requirements in Oklahoma. The only requirement is that you operate your homeschool for 180 days. You must teach the required subjects – those required subjects are math, reading, spelling and grammar, and good citizenship. As you can see, science and social studies/history aren’t required by the state, but most colleges will expect your student to have been taught those subjects. Therefore, it’s best to include them even though the state doesn’t require them. You must use a written curriculum (online schooling meets this requirement, too). If you’re planning an out-of-state move, one of the first things on your mind might be “What’s homeschooling like?” It’s good to look into this before making a move so you don’t end up in a state that’s very restrictive. Thankfully, there are several options that are very lenient. Tasha is a homeschooling mom to 5 and has been homeschooling for 14 years. Currently, her children's ages span from toddler to young adult. Tasha has a Bachelor's of Science degree in Social Sciences from Florida State University and is working on her MBA through SNHU/Berklee School of Music.